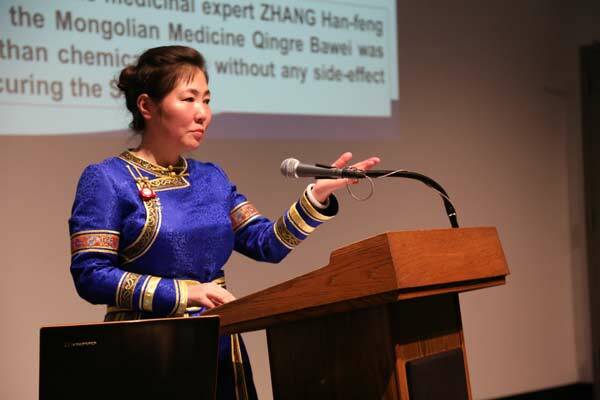 Beijing, 2014-05-05, China Daily – The practitioners of traditional Mongolian medicine want more people to know about the heritage of their healers, which dates back to the time of Xiongnu, the probable predecessor of the Huns, and they now want to take it abroad. In February 2013, a six-member delegation traveled to the United Nations headquarters in New York and attended an international forum organized by the World Health Organization (WHO), where its members delivered a speech on the function and role China’s TMM has played on the lives of its urban and rural residents. The delegation was led by Ulaan, director of the State-owned Inner Mongolia International Mongolian Hospital that opened in Hohhot in April 2012. It is currently listed among the country’s top hospitals, and almost 400,000 patients were treated in 2013, according to Ulaan. The total number of treated patients has now surpassed 700,000. At the UN meeting, executive director of WHO Jacob Kumaresan applauded the delegation for bringing the first traditional Mongolian medicine from China to the UN podium. Ulaan attributes this chance to good fortune. “We were invited because WHO specialists visiting Inner Mongolian were dumbfounded when they saw how our physician put together a leg fracture within 10 minutes,” she says. “And I used acupuncture to cure a patient’s numb shoulder right under their eyes. It only cost 16 yuan ($2.60). “They all thought I made a mistake when I used acupuncture on the patient’s feet. They could not understand why I did not use it on the shoulder. That is something hard to explain within a short time,” she smiles. Ulaan estimates the cost is generally 40 to 50 percent lower as TMM relies more on the doctor’s experience than sophisticated medical instruments and expensive drugs.